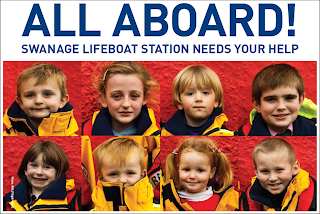 Calling all junior supporters of Swanage RNLI! How would you like to be in with a chance of winning an RNLI goody bag worth £30? Your mission, should you choose to accept it, is to make an RNLI-themed charity collection box and collect as much money in it as you can for the Swanage RNLI boathouse appeal. We'll be awarding two prizes: one for the best collection box design and one for the most money raised. What better way to recycle all that Christmas wrapping paper in January?! Bring your collection box and any money you've raised to the lifeboat crew's SOS Day car wash at King George's playing fields (entrance on Victoria Avenue, Swanage) on Saturday 1 February 2014 between 11am and 3pm - Mum and Dad could even get their car washed while you're there! The winner will be chosen on Friday 7 February. Good luck! Any questions? Email enquiries@slbf.org.uk or post on our Facebook page. 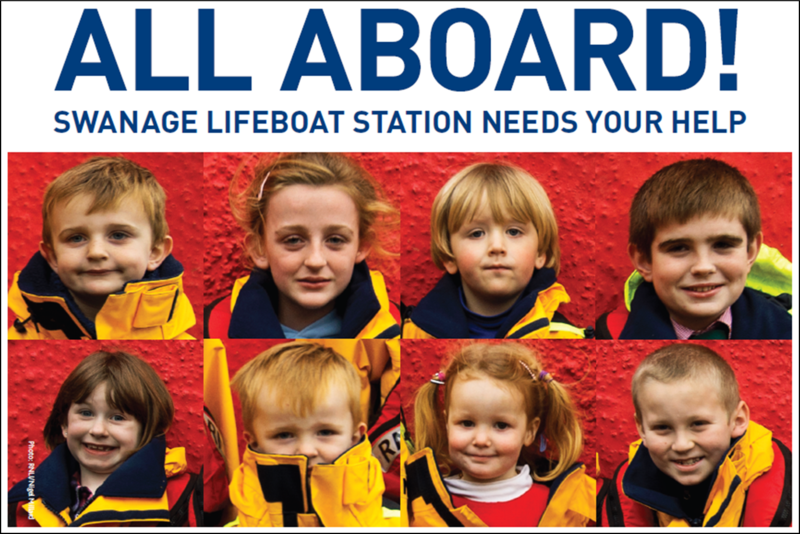 For more information about our boathouse appeal, visit RNLI.org/SwanageAppeal. Read our full competition terms and conditions. 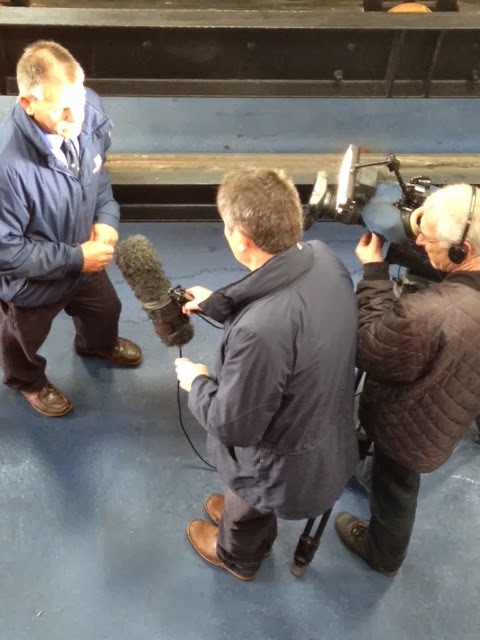 We've had some really interesting visitors at the lifeboat station recently and today was no exception. 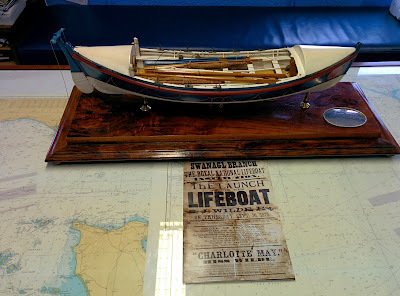 A few months ago we were contacted by Mr Wilde who had a model of our first lifeboat 'Charlotte Mary' he wondered if we would like to have it on long term loan for display at the lifeboat station. This afternoon he and his daughter popped in to drop the model off and have a chat. To say that we were amazed by the model is an understatement! 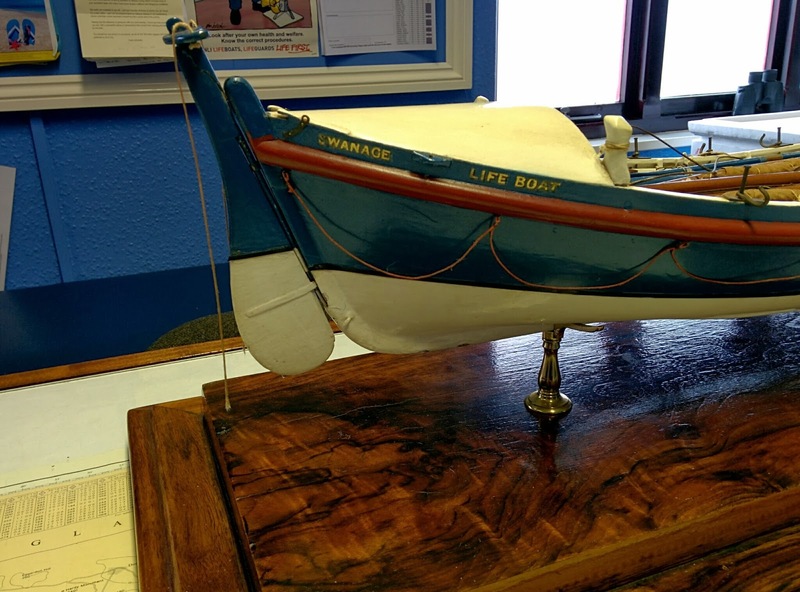 The model was presented to Mr Samuel J Wilde (Mr Wilde's Great Grandfather) in 1875 when he and his wife named the lifeboat in Swanage. 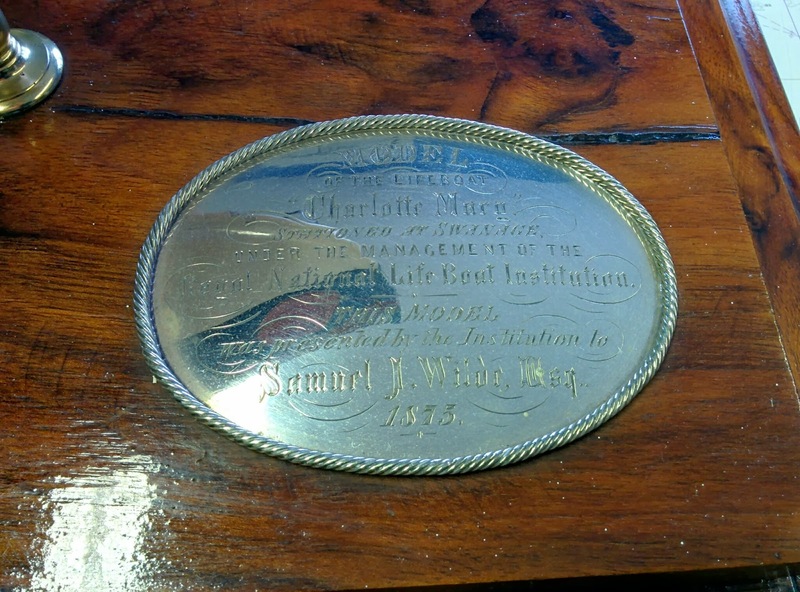 Samuel Wilde was the Nephew of Miss Margaret Ryder Wilde who had left a legacy to buy a lifeboat, it was named 'Charlotte Mary' after her youngest sister. 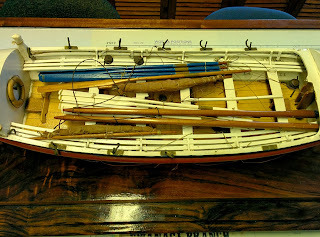 The model has been in the family ever since and is in remarkable condition considering that its nearly 140 years old and has travelled with the family as far away as Africa! Sadly the glass case is missing but we hope to get this replaced in due course so that it can be put on display in our new lifeboat station. 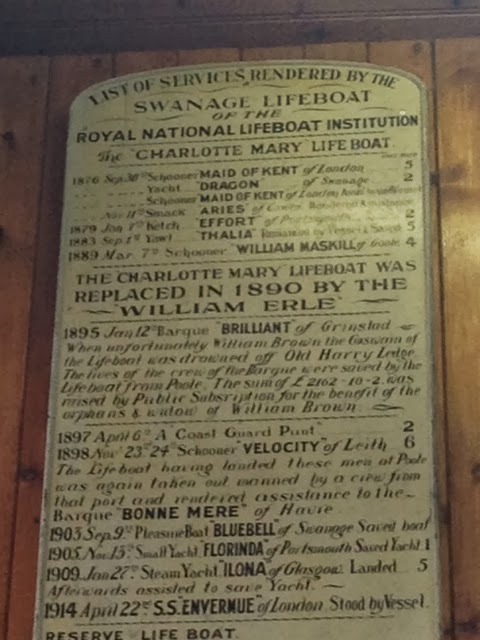 If you'd like to read more about Charlotte Mary's naming ceremony then download [ Click here ] this PDF, its an extract from the RNLI's in house magazine from 1876 (Copyright: RNLI - taken from the Complete Historical Archive of the Lifeboat Journal). 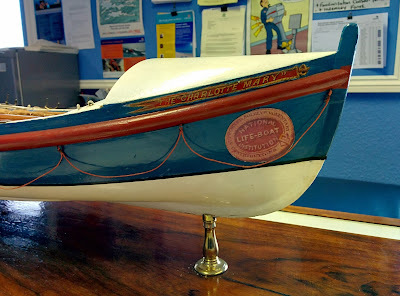 We'd also really like to see some pictures of the lifeboat at sea or in her boathouse as we don't have any of this boat at all, do please get in touch if you can help. Thanks again Mr Wilde, it was great to meet you, rest assured we'll look after your boat. 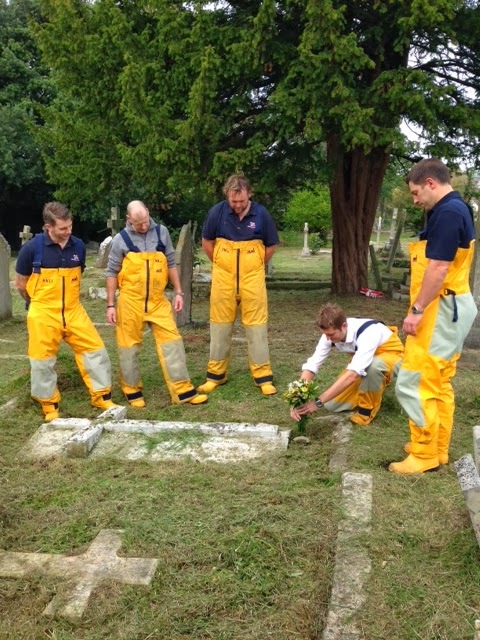 The volunteer crew of Swanage lifeboat welcomed a very special guest on Friday afternoon: the last surviving grandchild of the late Swanage lifeboat coxswain William Brown. 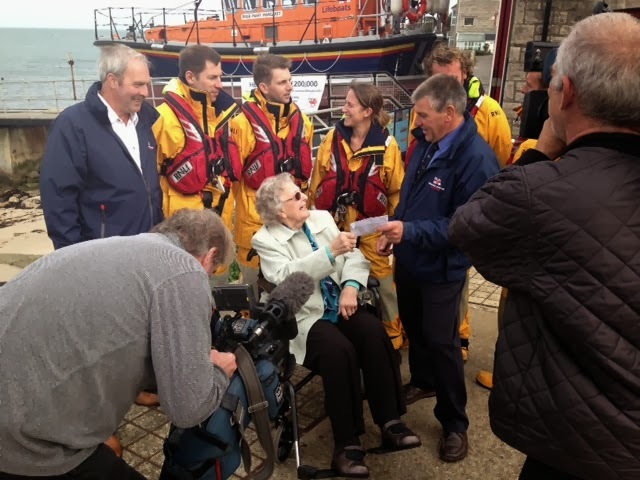 Marion Mason recently celebrated her 90th birthday but kindly asked her family and friends, instead of giving birthday presents, to make a donation to Swanage RNLI’s new boathouse fundraising appeal. 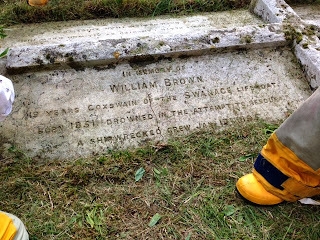 In 1895 Swanage lifeboat Coxswain William Brown made the ultimate sacrifice: he was drowned while trying to rescue the crew of a barque sailing boat off Old Harry Rocks. 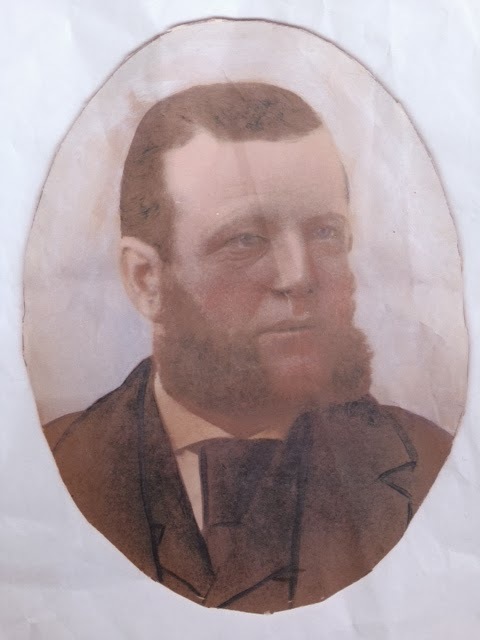 The volunteer lifeboatmen battled through rough seas aboard the rowed lifeboat William Earle II; two of the crew were washed overboard but sadly only one was recovered: Coxswain William Brown was lost at sea. 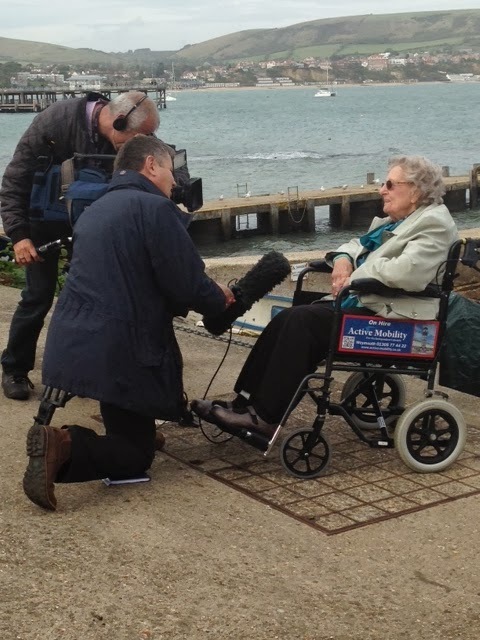 William's granddaughter Marion, although not alive at the time, remembers the aftermath of the tragedy. 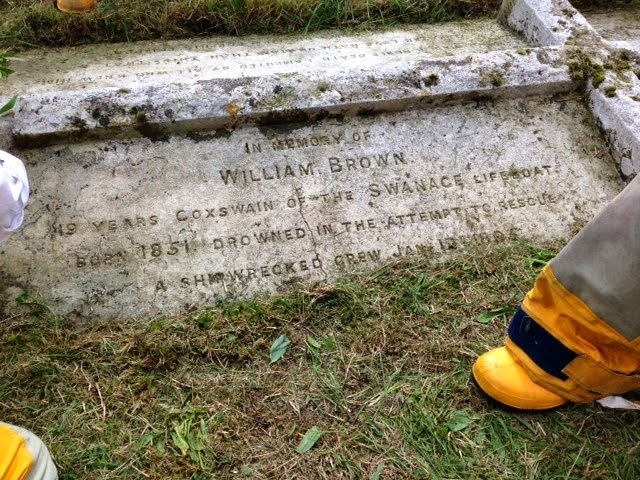 Her grandmother, William Brown’s wife, went on to raise her seven children single-handedly and continued running the family fishmongers on Swanage High Street to support them all. Over the years, Marion has followed the activities of her local lifeboat stations, Swanage and Weymouth, where she now lives. On Friday, she visited our current volunteer crew at Swanage Lifeboat Station to present us with her generous donation. As they chatted, Martin discovered an extremely unlikely coincidence: as a child, Marion had lived in the same house in Swanage that he now owns with his wife! Marion's story even made it onto BBC South Today on Friday evening - if you missed it, you can watch the clip on YouTube here: http://goo.gl/wAujMS. With any luck, we'll also be on Meridian's evening news this week - we'll keep you posted on our Facebook page! 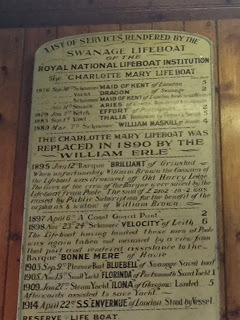 For more information about the fundraising appeal for Swanage RNLI’s new boathouse, please visit RNLI.org/SwanageAppeal. To donate £5, text RNLI SWANAGE to 70300. "Do-si-do" you fancy a great night out in Swanage? The Swanage Lifeboat Fundraisers are holding a traditional barn dance at The Old Malthouse in Langton Matravers on Saturday 19 October. Come along and join in the fun from 7.30-11pm, while supporting your local lifeboat. All proceeds from the event will go towards the boathouse needed for our new faster lifeboat that arrives on station in 2015 - it'll help us reach casualties quicker and ensure our volunteer crew return home safely from rescues. Tickets are on sale now - just drop in to the RNLI shop in Swanage town centre or to Corbens Estate Agents. Adult tickets cost £10 and kids' are half price. There'll be a bar, a raffle, and your ticket price even includes a pasty for your supper! Fancy dress is not compulsory but we're sure you've got a pair of cowboy boots hiding out in the back of your cupboard that deserve a dusting off! We're looking forward to seeing you there! Yee-ha! Grant 'the Ironman' Walkey needs your support! On Sunday 8 September RNLI Casualty Care Trainer and Swanage lifeboat crew member Grant Walkey will be undertaking the immense Ironman Triathlon in Tenby, Wales – all in aid of Swanage Lifeboat Station and Cancer Research UK. The triathlon involves a 2.5 mile sea swim, a 112 mile bike and a 26.2 mile marathon run. Completing the triathlon has always been a personal ambition for Grant, but he is also using the opportunity to raise money for the Swanage Lifeboat Station Appeal and Cancer Research UK. Grant would welcome any support and encouragement before the big day! If you would like to sponsor him you can visit his Just Giving page here. Good luck Grant! And thank you to all the crew and lifeguards who will be providing safety cover at the event. People have already started snapping up our 2014 calendar at our events during Lifeboat week. Don't worry though you can still get your hands on one from the lifeboat shop in the square or the lifeboat station for just £5. The calendar is A4 in size and features some great photos of our lifeboats, the crew and some of the volunteers that give so much of their time to the station. All monies raised from the sale of the calendar will go towards the appeal for our new lifeboat station. 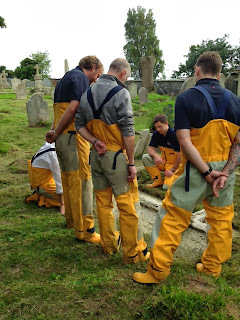 Making the decision to become a volunteer lifeboat crew member is a huge commitment. On joining, the members agree to run to the call of the pager day or night, 365 days a year, often leaving occasions with friends and family or rising from their beds in the depths of the night. 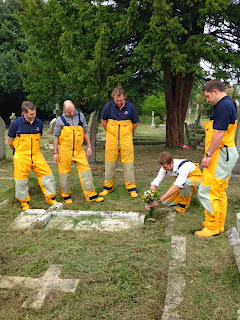 Yet despite these sacrifices many make the RNLI part of their lives and remain volunteer crew for many years. 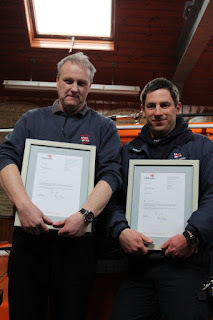 Last month two of the crew at Swanage, Colin Marks and Dave Turnbull have received long service awards from the RNLI for 20 years voluntary service. Colin and Dave joined the crew a month apart with Dave joining in December 1992 and Colin in January 1993. Since then they have been involved in more than 1400 rescues to aid those in trouble at sea. Colin joined as a volunteer lifeboat crew member on both the inshore and all-weather lifeboats, retiring from the inshore lifeboat in 2003. Colin has become one of the all-weather lifeboat assistant mechanics that are on hand to monitor and maintain the lifeboat whilst at sea. This role also sees him volunteering an extra evening every week to perform maintenance of the lifeboat so that it is always ready to go to sea. In his time as a crew member at Swanage Colin has clocked up more than 1000 hours at sea on rescues with over half of them being during the hours of darkness. 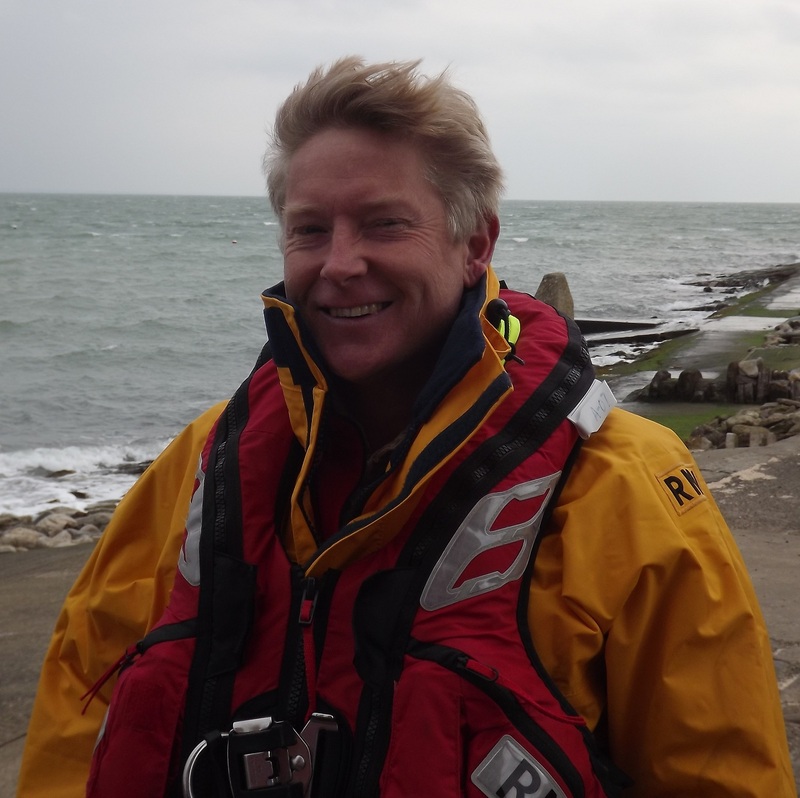 During Dave’s years of voluntary service he has also served on both the inshore and all-weather lifeboats at Swanage. 10 years after joining the lifeboat crew Dave took on the role of fulltime station mechanic in February 2002. Dave therefore commits both his work time and personal time to the RNLI’s service of saving lives at sea. 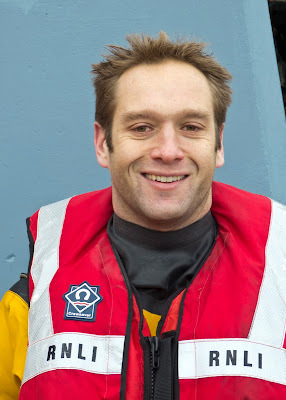 Dave is also currently one of the second Coxswains on the all-weather lifeboat as well as one of the volunteer mechanics. Over the years Dave has been involved in more than 840 rescues, totalling more than 1400 hours at sea with over 800 of those being in darkness. The awards were presented to Colin and Dave at the Swanage Lifeboat Station to honour their voluntary commitment and dedication to the RNLI. Lifeboat Operations Manager, Captain Neil Hardy commended Colin and Dave on their achievement saying “you cannot put a value on the contributions volunteers such as Colin and Dave have made to the RNLI and the part they have played is rescuing those in trouble around our coastline. 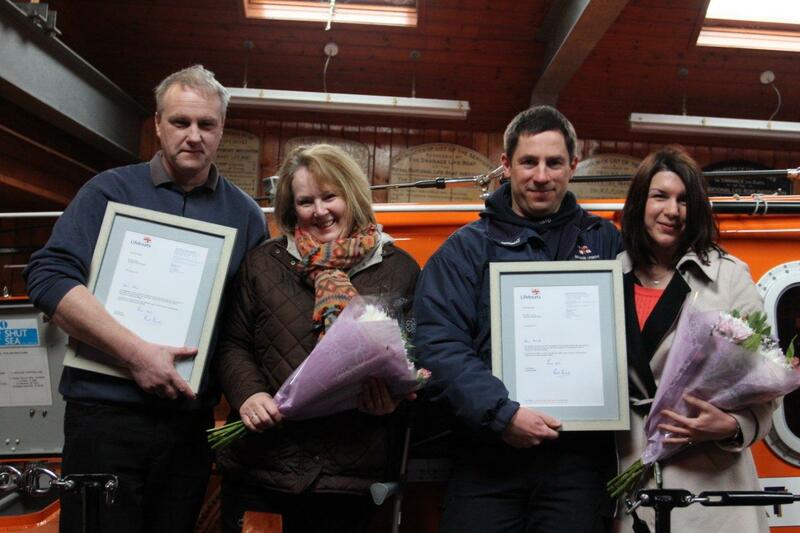 Their experience and dedication is testament to the Institution and our community.” Recognising that this level of commitment to the RNLI is not possible without the support of those around you, Cheryl and Angela, the wives of Colin and Dave respectively were presented with a small token of appreciation for their patience and understanding over the many years of service. The final of the RNLI Indoor Bowls Competition took place recently. Now in its fourth year the successful team were presented with their trophy by Swanage Indoor Bowls Chairman Mr Terry Buck. 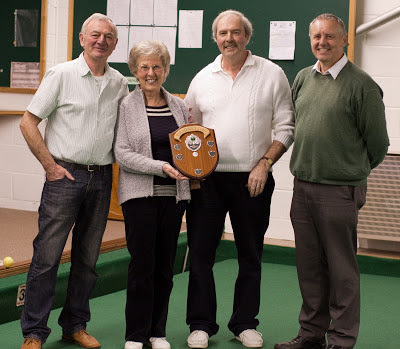 The winning team of Paul & Carole Knapman and Peter Foster won a tightly fought final on an extra end. All the participants some 40 through the season were thanked by Swanage Lifeboat Chairman Peter Foster for helping to raise the great sum of £560. The chicks are knitted by members of the Swanage Lifeboat Fundraisers and each one contains a delicious Cadburys creme egg. We're very grateful to Sainsburys in Wareham for donating the eggs, this means that the chicks are 100% profit and all the proceeds can go to the RNLI. Mamma Mia! What a result! 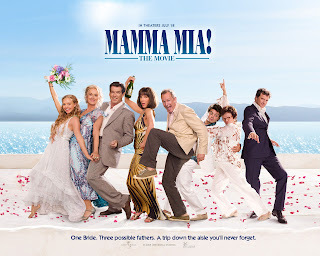 This time last week, we were gathered at The Old Malthouse at Langton Matravers, singing along in great voice to Mamma Mia! on the big screen. It was a great evening with an outstanding turnout and some of the costumes were fabulous! Now we've counted the pennies and pounds, and are thrilled to tell you that your support for Swanage RNLI raised an incredible £752! We are so grateful - yet again, the Swanage community rallied together in fine form to support our local lifeboat. So thank you for your generosity - we hope you enjoyed the evening as much as we did. We'd love to hear your feedback on the evening and how you think it could be improved on if we held it again, so please do get in touch with any comments or ideas - leave a message on our Facebook page or email enquiries@slbf.org.uk. Calling all super troupers and dancing queens! The Swanage Lifeboat Fundraisers are sending out an SOS: you’re invited to join us from 6.30pm on Friday 15 February at the Old Malthouse in Langton Matravers for a Mamma Mia! sing-along evening. The ‘name of the game’ is a viewing of the hit 2008 musical – with a difference: everyone is positively encouraged to join in and sing along! There’ll be an optional ABBA fancy dress theme for the night and a prize up for grabs for the best outfits, so don your highest platforms and simply say ‘I do, I do, I do, I do, I do’, and help raise funds for your local lifeboat while enjoying a great evening out. Children are very welcome at this family-friendly event and soft drinks will be on sale throughout the evening, but guests are free to bring their own alcoholic drinks. For those feeling lucky, we'll also be holding a raffle with plenty of locally-sourced prizes. Tickets are on sale now and can be purchased from the RNLI shop in Swanage town centre, as well as Corbens Estate Agents and at the door on the night – adult tickets cost £8 each and child/concession tickets are just £5. So why not opt for a Valentine’s Day treat with a difference? Just make sure your mother knows that you’re out! For more information, email enquiries@slbf.org.uk. SOS Day 2013 - the results! For those of you who joined us on Saturday to have your car washed, sample a bacon butty or a slap-up, homemade lunch, you'll know that our volunteers were out in force at the weekend for SOS Day, the RNLI's annual day of fundraising. The lifeboat crew were out in the chilly January air, scrubbing cars clean in exchange for donations; several dedicated fundraising volunteers held a collection outside the supermarket; and a whole gang of volunteers from the Swanage Lifeboat Fundraisers held a charity lunch - even the local scouts got together to provide some delicious homemade puds! 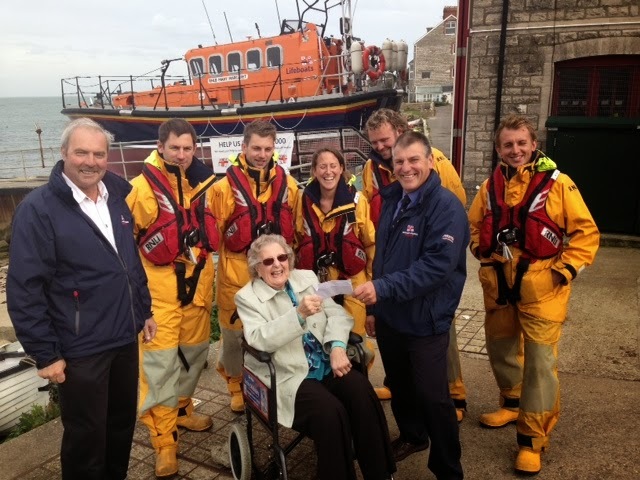 It was fantastic to see our community rally together to show such support for its local lifeboat, and we're absolutely thrilled to say that you raised a whopping £1,710 - a phenomenal achievement! We're incredibly grateful to everyone who donated both time and money - thank you. From 9.30 on Saturday morning, the lifeboat crew themselves will be out in force at the car park at King George’s playing fields, armed with sponges and buckets, to wash your cars in exchange for a small donation – simply drive over to see us and we’ll do the rest. What’s more, we’ll be serving bacon butties and hot drinks to keep you warm while you wait. And if you fancy treating yourself to a tasty, home-cooked lunch on Saturday, why not head over to the Catholic Hall on Rempstone Road, where volunteers from the Swanage Lifeboat Fundraisers will be serving up a range of delicious homemade soups and puds – including crumble, trifle and banoffee pie made by Fourth Swanage Scouts! Between 12 and 2pm, you can enjoy a two-course meal with tea or coffee for just £6 – pick up a ticket from Corben and Son Estate Agents on Station Road. Our volunteers will also be holding a fundraising collection outside Co-op tomorrow on SOS Day itself, so if you’re stopping by to do your shopping, please feel free to give whatever you can – it’s all for a great cause! We look forward to seeing you this weekend and, please, spread the word! Thanks in advance for your support, from all at Swanage RNLI. The first shout of 2013 was not long in coming. Portland Coastguard requested the launch of the Swanage's D-Class Inshore Lifeboat to go the aid of a black and white springer spaniel that had run over the cliff at Old Harry Rocks. 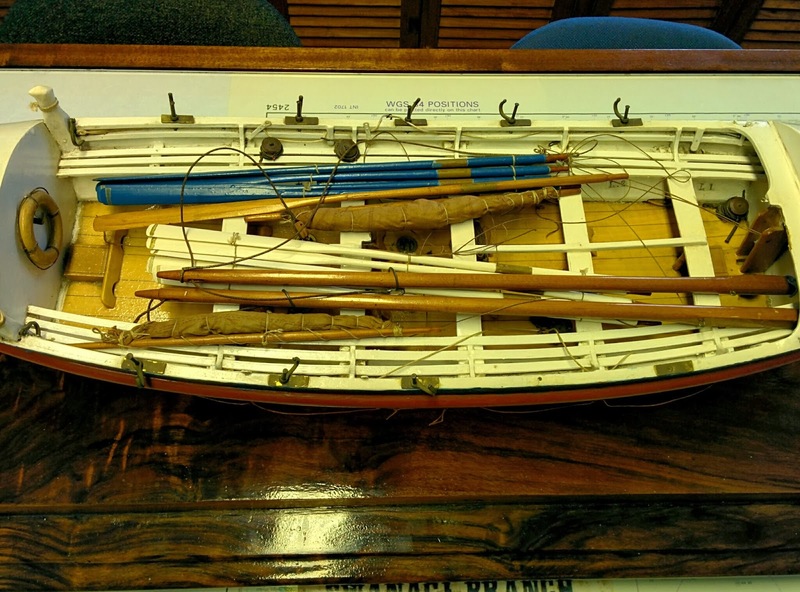 A passing fishing vessel reported that the dog was swimming in shallow water but they couldn't reach it. 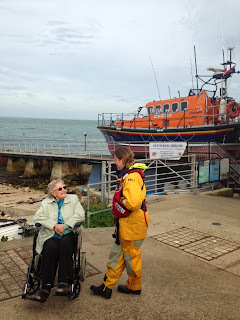 Swanage's volunteer crew pagers were activated and the lifeboat launched 7 minutes later. Once on scene two crew were put into the water to try and locate the dog. The dog was soon found safe and well on a ledge just out of the water. The crew recovered the dog and took her to South Beach, Studland and handed her over to the owners who by this time had been taken there by the volunteers from Swanage Coastguard. With the situation resolved the lifeboat returned to Swanage to be washed down and made ready for the next service.